This is why I like these snaps. Note how the copper color shows how much the teeth abraded off the blk coating. Just imagine the result of no snap swivel on this 1. Should the lure spin? I get great side action but also noticed the lure is spinning. Is this normal? It happens when I attach the lure directly to a snap swivel. Maybe I'm using the wrong type of swivel. I get better action when I tie the leader directly to the lure and use the swivel in between my main line and leader. do you get line twist? I like ball bearing swivels to help eliminate line twist and the subsequent birdsnests. Line twist hasn't been a issue. would a regular snap swivel be just as good? Not even close. They won't accidentally open from the fishes mouth crunching on it. do you know where i could get something like these on island? okay...i just bought a lure yesterday thats why and wanted to try it this weekend that's why. another thing you can try is to attach a Spro swivel with a GOOD quality split ring. This will give the larger lures mo betta action. For your 1oz and 1/2oz lure, which size swivel would you use? I use the #2 rated 44lbs for 1/2 and 1 oz. And #4 rated 100lbs. for the 1.5 and 3 oz. Time to resurect this topic. I will never use a snap swivel again. Strickly McMahon snaps from now on. I lost a green 1oz MW lure with the orange and yellow skirt, plus the estimated 5 to 7 pound papio today when the fish bite down on the swivel. I got the swivel back all strechted open and nicks on the leader line, but no papio. I saw the fish wack the lure, do a flip and pull for maybe ten seconds then Pau. NO MORE FISH. And this was the lock snap swivel that has the bend in the wire that locks so it will not pull straight. 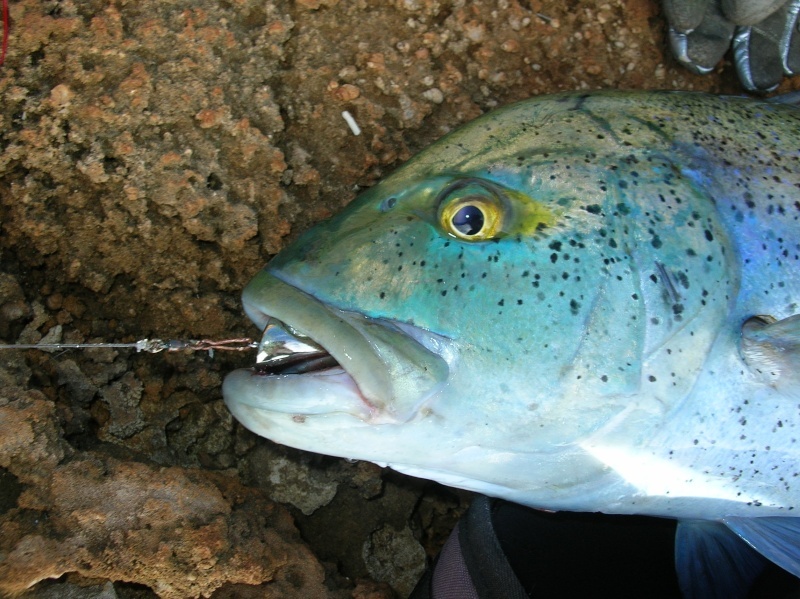 I use # 6 McMahon swivels on my Ulua poles, but like one Babooz I thought neva need for the spinner action. So it is time to pick up some # 2 and # 4 McMahon snaps and order more ceramics from mark. Location : Australia, Top End. You know it is fun, What you guys call a McMahon snaps, down here we call them a Hawaiian snap. And yes we do tend to say that they are the most reliable one. I went back and noticed that Mark, I am hoping they will come as they are in the Berkley packs which show the bearing swival. Either way that is not a bad price and I have some bearing swivals somewhere around I got a few weeks ago, now just gotta find it. Those are cheap!! Looked at Cabela's and theirs cost a lot more. I was wondering if anyone tried using the mcmahon #3 swivles for 1/2-1 oz. lures? Was wondering if they would be too big for the 1/2 to 1 oz. lures. Any ideas? Look at Marks post on top, it's what he recomends for swivel to lure size. I would say #3 would be fine. When I ordered them I wanted #2 and #4, but #4 was out so I settled for #2 and #3. I just got the McMahon snaps in the mail just now and Mark you were right. They came with regular barrel swivels. No problem though, I can replace them with bearing swivels I have. Also what's funny, their ratings are backwards. The #2 actually has size 2/0 on the bag, the snaps are bigger and rated for 110 lb's and the #3 snaps has size 3 on the bag and are smaller rated for 80 lb's. The #2 came two in a bag and the #3 came three in a bag. Their barrel swivels are good though, they spin really easy. Still a deal for .99 cents a bag. I got five bags of each. Made by Berkley. I was looking at what Mark suggested, just wasn't sure if a #3 McMahon would be an alright substitute for a #2. Gotta give them a try soon! Congrats on the cheap finds!